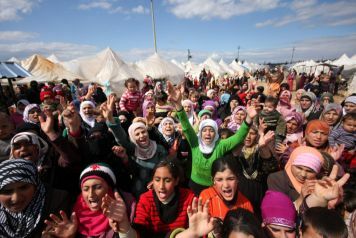 The number of Syrian fleeing violence to Turkey has reached 16 thousand. The Red Crescent has already sent additional truckloads of tents and logistical support to the region to accommodate the new refugees. The Red Crescent currently operates seven camps in Hatay. There is another 10,000-person camp under construction in Kilis, composed of containers where people will have kitchens, bathrooms, and toilets in the unit. Healthcare and all the basic needs -- including food three times a day -- are provided. You can help too by helping 'Lily' Love In the Language of Yarn send blankets to help keep the refugees warm and add a little comfort. We are a newly formed non profit organisation and at the moment a small group of knitters. Our goal is to send 100 blankets to the Humanitarian Relief Foundation to be given to Syrian refugees. 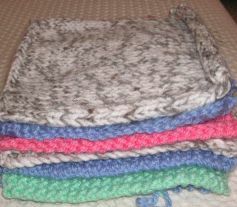 Can you spare a little of you time to knit or crochet an 8inch square or maybe two or three? In most countries you can send up to three squares for the same cost as one,3 squares should be accepted as a standard international letter rate.